Cynethryth was the wife of the powerful Offa, King of Mercia. Offa’s ambitions to carve out a united kingdom is also demonstrated by his monetary reforms. 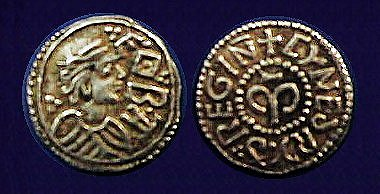 King Pepin in France introduced a broad silver denier with a weight of 20 grains (1.3 grams). This monetary reform in France was continued by his son Charlemagne. While the exact year of Offa’s monetary reform is not known, it is clear that this continental influence was the model for his abandonment of the old Anglo-Saxson sceat and the introduction of the silver penny throughout England. In addition to strike two bery rare gold issues, Offa also struck a silver penny with the portrait of his wife. These issues are quite rare but it demonstrates that Offa was attempting to create a new and great kingdom in England. It is not known what happened to Cynethryth following Offa’s death in 796 AD. NOTE: Offa was the first of the post-Roman rulers in Britain to issue a silver penny with the portrait of his wife.